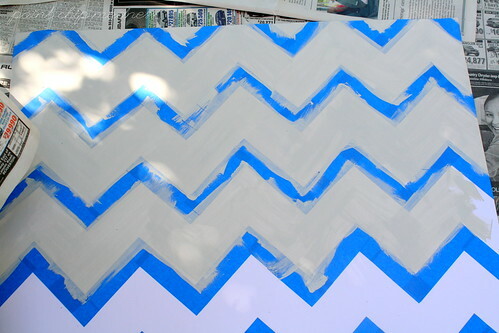 You know I love chevron stripes. You also know I love DIY projects. And I don't think you need me to start talking about my love for Pinterest. So what do you get when you put the three together? Take a look. 1. 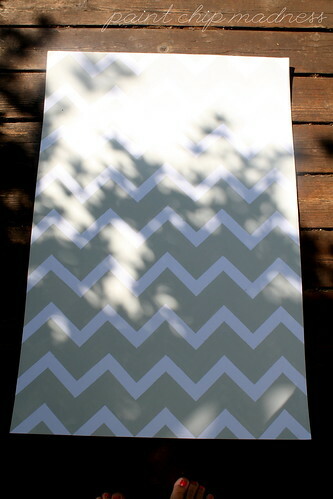 Cut out the stencil and save the middle zigzag (the dark one in the center of the page). You'll be using it as a stencil to tape around. 2. 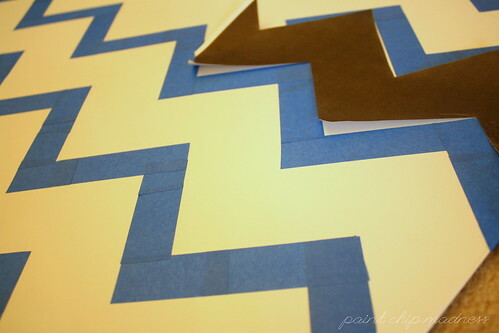 Using the stencil as a guide, tape around the zigzag along the mat. 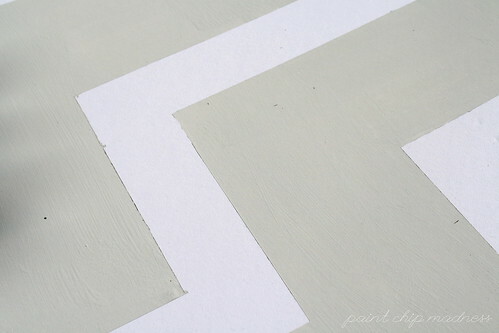 Use the width of the painter's tape as the white zigzags in between (it should be a near perfect fit if you try it on the stencil). You'll have to scoot the stencil down the mat as you go. You'll also need a good movie or something to keep you occupied. I ended up watching part of The Patriot because my dad left it on. You may want something you're interested in because it'll take you a couple of hours (at least for a DIY novice slash sort of perfectionist like me). 3. As I mentioned earlier, I ended up mixing my white and grey paint to make a lighter shade because I didn't want my chevron stripes to contrast too much and give me a headache every time I entered my room. But you can choose whatever strikes you fancy. 4. 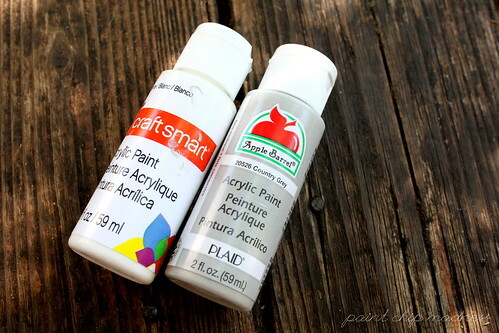 Here's the fun part (at least for a paint lover like me): painting! 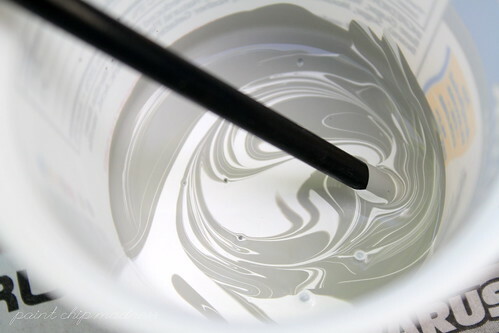 If you've smoothed out the tape and secured it well, you shouldn't have to worry about paint leaks. I did a light coat just to make sure the grey didn't get too dark. One coat also makes it dry faster which was good for my anxious and impatient self. 5. I waited maybe five minutes before I ripped off the tape. But I also checked it with my finger just to make sure it was dry. I was a little worried that my grey looked a bit tan (too yellow) but I was pleased to see it dry more grey in the end. 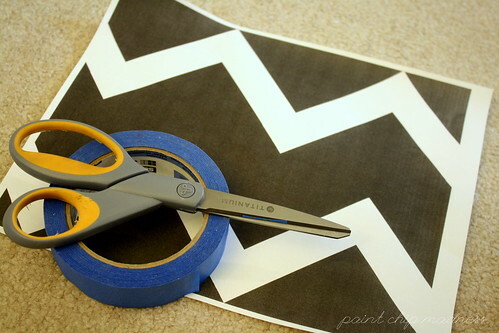 Take the tip from Jess Constable (who guest posted on decor8 with her version of DIY chevron art here), pre-cut pieces of painter's tape before you start taping. It makes the process much easier! I didn't worry too much about little oopsies here and there (when paint leaked into the stripes). To me, it makes it more original and less perfect. It also meant that I wouldn't have to paint every white stripe (what was underneath the tape) since my white paint didn't match the mat color. 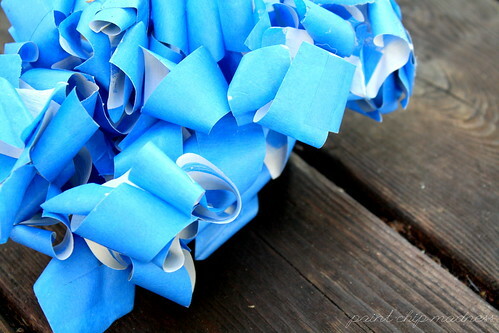 What DIY projects have you tackled lately? 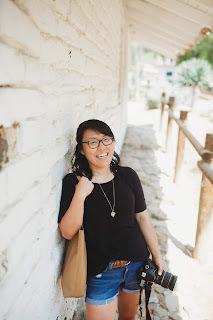 Any tips you have to share?